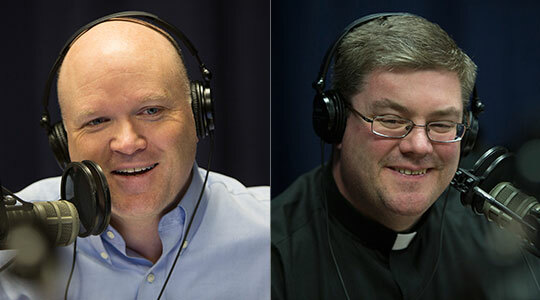 Summary of today’s show: Everyone has favorite church hymns and a reason why they moves us, whether from a cherished childhood memory or how they move the spirit to contemplate God, and so on today’s show Scot Landry, Fr. Chris O’Connor, and Rick Heil share with listeners their lists of their top three favorite hymns and count them down like Kasey Kasem. 1st segment: Scot Landry and Fr. Chris O’Connor greeted all listeners. Scot noted that Fr. Chris has just been inducted into the Equestrian Order of the Holy Sepulchre. They discussed that the Knights of the Holy Sepulchre have the right to ride a horse into any church in the world, although they don’t know where it came from. Fr. Chris said it started in the Crusades to protect the tomb of Christ and they continue that work today, providing funding and assistance to protect the religious site there, but also to bring Muslims and Christians together in the Holy Land for peace. Fr. Chris said about 70 men and women from around New England were inducted into the order in a special ceremony. Fr. Chris also said that they had the seminary Thanksgiving dinner this week before the seminarians return home to their families. They reflect on God’s goodness and the many ways he blesses their vocations. Scot noted that tomorrow will see the broadcast of interviews with Cheverus Award winners from this past Sunday. He also noted that Cardinal Seán published his second pastoral letter of 2011 one year ago today on the Sunday Mass participation. Today, Scot said they’re counting down their favorite church hymns. He said the idea came from a discussion with his 10-year-old son this past weekend about how he’s preparing for Advent at the Archdiocesan Boys Choir School. Scot encouraged listeners to make their own list of their favorite hymns and email them to us at Live@thegoodcatholiclife.com or post them in the comments on our website or on our Facebook page. Scot’s favorite church hymn of all time begins. Rick played a clip: O God Beyond All Praising. He first heard this at the Pontifical North American College and later it was the recessional at his wedding. Fr. Chris said that Msgr. James Moroney, the rector of St. John Seminary, said this is his favorite hymn as well. Fr .Chris said one of the Eucharistic Prefaces reminds us that God doesn’t need anything so all we can offer Him is our praise. Fr. Chris said it reminds us to open ourselves to the Lord in both our Easter Sundays and Good Fridays. Now to one of his favorites: The Litany of Saints from the Youth Rally in New York with Pope Benedict in 2008.
to the culture of death. Philadelphia and all your Church. Fr. Chris said it reminds us that the Church is not just the Church we see and touch, but also the spiritual reality of the holy and blessed ones who intercede for us. Scot said when this is prayed during ordination, the men are prostrate before the altar as the people pray for them. Fr. Chris noted that most of the saints in this specific litany are saints from the Americas. He said the litany often changes the names of the saints prayed for to include, perhaps the patron saints of the men preparing for ordination or the patron saints of a religious order of the like. Scot said the various litanies have basically the same lyrics. Fr. Chris said he picked this one for the peaceful music. Rick makes his first choice: Exsultet. This version was chanted by Fr. Jonathan Gaspar of the Office of Divine Worship for the Archdiocese. Rick said he chose it because Fr. Jonathan sang it on the show a couple of years ago and it stuck with him for 3 months afterward. Scot said when music moves you, it’s usually a five sense experience. The first time he heard it at the Easter vigil, seeing the church in darkness except candlelight, smelling the incense and lilies. Taking it all in, the sense of darkness and joy that Christ has conquered death. They then discussed the difference between hymns and other music. Fr. Chris said hymns are usually music that everyone sings and this is music sung only by the deacon or priest or cantor and it’s a very difficult piece of music. The next song from Scot is Let All Mortal Flesh Keep Silence. Scot said the first time he heard this experienced well he was in the choir of the Pontifical North American College during the Liturgy in St. Peter’s Basilica for the ordination of deacons. He talked about how the song built up from silence to a triumphal Alleluia. Rick said he also chose this hymn because he loved a Gustav Holst arrangement of this hymn. Fr. Chris said the chant is sung in successive different languages and it symbolizes Pentecost and how the Apostles were enabled to speak in many tongues. It also reminds us of the universality of the Catholic faith. Scot said it’s a simple hymn to sing along to and to pray for a long time as it’s sung. You don’t need a hymnal, singing experience, or a singing voice. Everyone can participate in it. Fr. Chris talked about how the Holy Spirit is sometimes spoken of as the breath of God and how the hymn invokes the sense of breathing. Rick’s second hymn is Cantate Domino. He said it’s one verse that’s repeated over and over with slight changes. proclaim his salvation every day without end. in every land tell his marvelous deeds. Rick said he tends to like happy music, that have a lot of harmonic movement. It’s joyous praising. The words aren’t ambiguous and there’s not a lot of hidden meaning. He said as he was learning Latin in high school after having learned this, he began to appreciate it more. He encouraged others to learn the meaning of the Latin words. Fr. Chris said they do a fair bit of Latin at the seminary. He has a strong belief we should know what we’re singing, saying, and praying and is always grateful to see the English translation. The Latin helps us to transcend the here and now. Scot said there’s something about the use of language to bring our minds to God and to bring heaven to earth. Scot’s third hymn is All People That on Earth Do Dwell, also sometimes called the Old One Hundredth. Direct link to the version heard on air. Scot said he loves big organ hymns, but loves all types of music too. But no other instrument cranks as hard as the organ on this song and you can sing as hard as you’d like. He said the interlude before the last verse makes him joyful. Fr. Chris said it’s based on Psalm 100. Rick said the first time he’d heard this song on a big organ was it was played on the giant organ at St. Charles Borromeo Seminary. Fr. Chris said the next is a Christmas hymn and it will be jumping the gun a bit to hear it now: O Holy Night. Scot said it’s his favorite Christmas hymn as well. He and Fr. Chris said they broke the rules by playing it before Thanksgiving. Fr. Chris said it was a French poem written by a layman at the request of this priest. Scot said it’s the kind of hymn that can be sung by both men and women equally. Fr. Chris said his Christmas Eve tradition when he leaves his sister’s home as he drives through Brighton is to play this song very loudly.